Ella's Kitchen was created by Paul (Ella's Dad) as he believed everyone should have the opportunity to eat better and healthier food that is fun. Not only do Ella's Kitchen create great food which is filled with goodness but they also support the enviroment and local communities. Ella's Kicthen work alongside TerraCycle to turn empty packets into fun eco-friendly products. Ella's Kicthen mission is to "develop healthy eating habits that last a lifetime by offering a range of tasty, natural and healthy 100% organic foods for babies and kids, which are handy for mums + dads and fun for little ones." Ella's Kitchen do a wide range of foods from first purees to 'Big Little People'. The lovely people at Ella's Kictchen sent Jack and I some lovely products to review. We received a pouch of Thai Curry and a pouch of 'The Red One'. Firstly we tried the 'full of sunshine Thai Curry with lots of veg.' This was a bit hit with Jack. 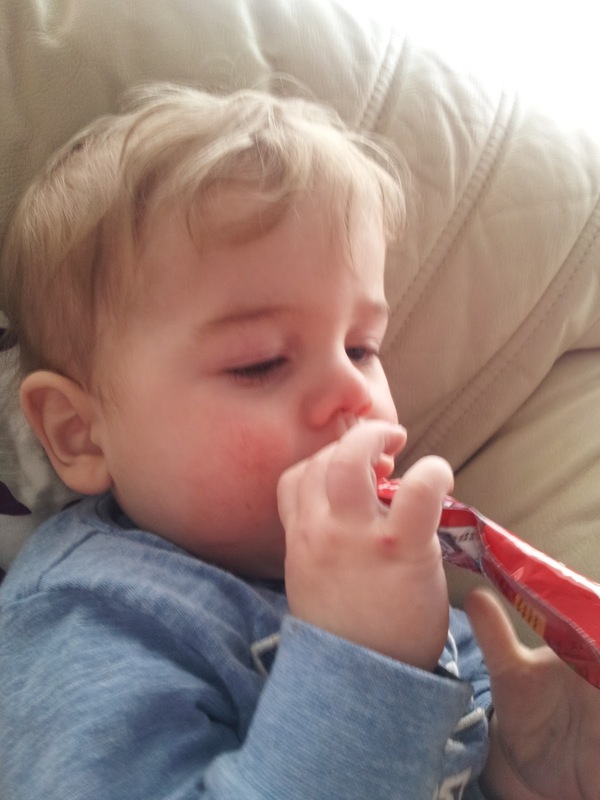 We try our best to give Jack a wide range of foods from many different cultures; this pouch fitted in great with this. The texture of this was still fairly pureed with a variety of chunks of veg within it. This was great for Jack (who will eat any lumps) but I believe it would also be great for a child who struggles with lumps. This is as there wasn't a lot so could still be handled. This pouch is a stage 3 and recommended from 10months. This pouch was made from a mixture of vegetables, rice, fruit & spices; all of which are 100% Organic. The pouch is gluten free, lactose free and suitable for vegetarians; therefore covering a wide range of diets. 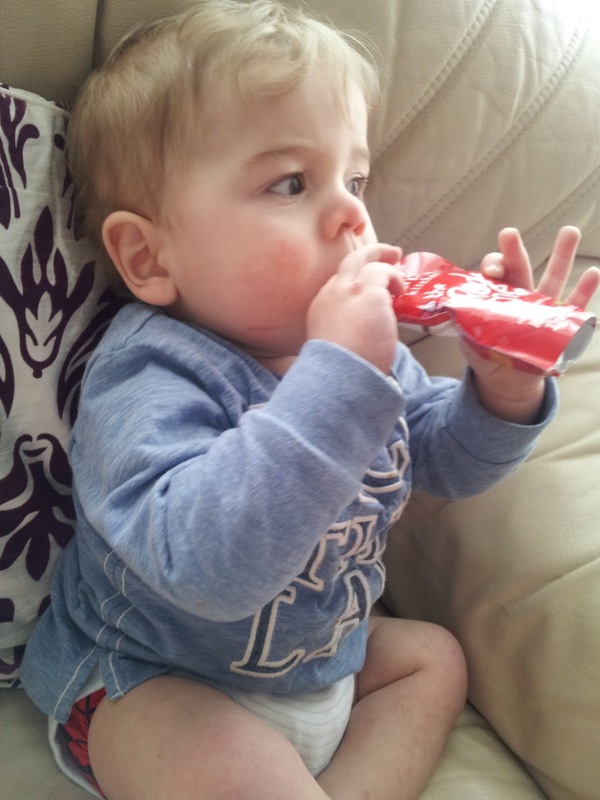 Jack really enjoyed this pouch, I couldn't spoon it into his mouth quick enough for him. He had no problem with the slight spices that are included. I felt there was a large enough portion for a baby who has a pudding as well. 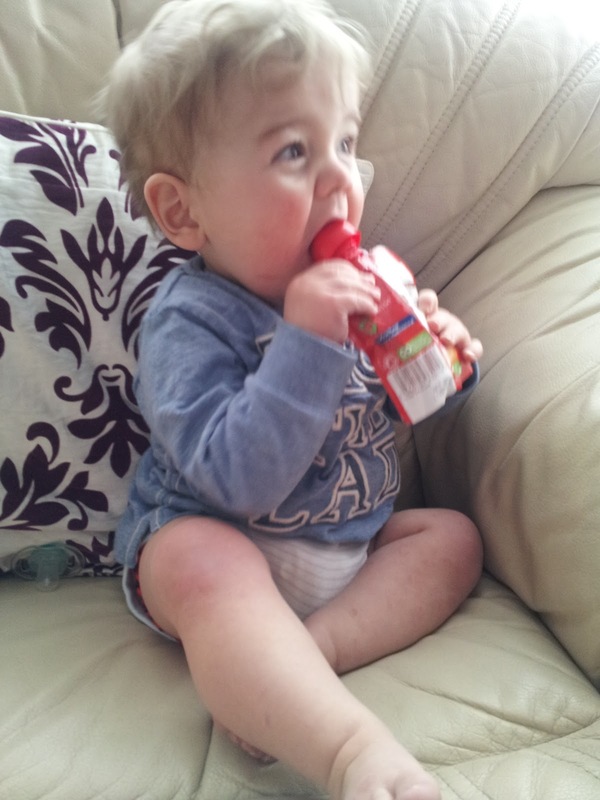 Jack also had 'The Red One' to try which is a smoothie fruit. This pouch is wonderful to give your child one of their five a day. It consists of 100% pureed fruit including strawberries, raspberries, apples and bananas mixed with a small amount of lemon juice; no water is added to this. This pouch is suitable from 6months. It is a lovely smooth puree which is easy for the child to swallow. Again, the pouch is gluten free, lactose free and suitable for vegetarians. Jack enjoyed this as a mid-afternoon snack; even managing to feed it to himself. Jack loves to be independant so the pouch in which this comes in was ideal for him. He really enjoyed the pouch and even carried around the empty packet. I think both of the Ella's Kitchen products in which we received were perfect products and perfectly suitable for the stated age ranges. Ella's Kitchen do such a large range of foods which I believe are perfect for a variety of lifestyles. They also have a specialy dietary range to cater for different dietary needs. These products can be purchased from a wide range of stores and can even be purchased outside of the UK; I believe this is yet another great touch to Ella's Kitchen. Please Note. These products were sent to me from Ella's Kitchen for the purpose of this review, all opinions and wording are my own.